This handout picture taken on March 16, 2014 and released by the presidential office shows Indonesian President Susilo Bambang Yudhoyono (seated 3rd from left) holding dialogue with farmers and land owners as they sit under a sky blanketed by haze in Pekanbaru, Riau province. ON THE second day of his Riau visit to tackle the haze first-hand, President Susilo Bambang Yudhoyono warned residents not to lie about what caused it, saying peatland was found in many other parts of Indonesia, but the fires were not as severe elsewhere. Speaking at a dialogue at a school in Siak regency yesterday, Dr Yudhoyono urged residents to report neighbours and others who carried out open burning. "Let's not lie among ourselves," the President said. "This (haze) is very harmful, and it is the community that is harmed." 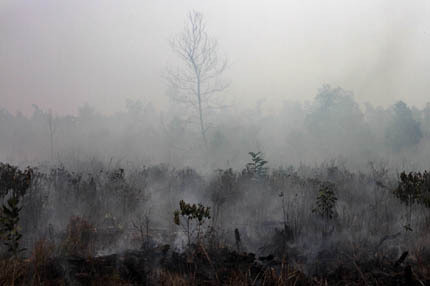 Peatland, which catches fire easily, is also found in South Sumatra, Jambi, Kalimantan and other regions in Indonesia. His comments, reported on the presidential website, come as rain from successful cloud seeding in most parts of Riau eased air pollution yesterday. PSI levels fell to 119 in Pekanbaru and 40 in Dumai, from earlier hazardous levels that crossed 300. "We hope in one week, the haze will significantly decline as long as there is no more new burning," said Mr Heru Widodo, head of weather modification at the Agency of the Assessment and Application of Technology, adding that they could carry out more cloud seeding. 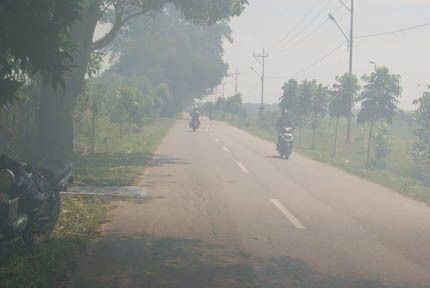 Many parts of Riau have been shrouded in haze for more than a month, prompting some residents to flee to neighbouring provinces. 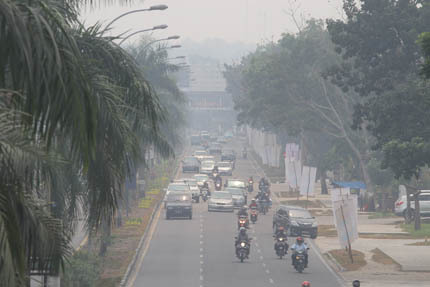 Doctors in Pekanbaru have asked children and pregnant women to evacuate the area, with air pollution hazardous for days on end. Yesterday, Dr Yudhoyono also held talks with regents and mayors across Riau, and told them to use their authority to enforce the law. Not doing so, he said, would amount to a breach of duty. "I feel embarrassed. There is fire on a land that is only 20km from the provincial capital, but no effort put in to fight the fire," Dr Yudhoyono said. 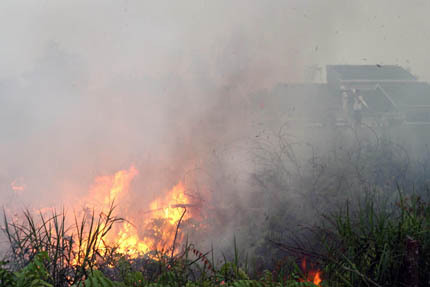 The national disaster mitigation agency said yesterday that police are investigating 40 cases of illegal land burning, involving more than 55 farmers and a person representing a sago plantation company in Meranti Islands regency, north-east of Pekanbaru. National police chief Sutarman said last Saturday that officers must not hesitate to shoot at anyone involved in the burning who resists arrest and poses a danger to the law officers. He added that there is zero tolerance for any rogue police officer who protects culprits, or who is involved in the environmental crime that causes haze in Riau. "If the haze travels to Malaysia or Singapore, I have to offer an apology to those countries... It is my responsibility if the haze travels overseas," Dr Yudhoyono said. 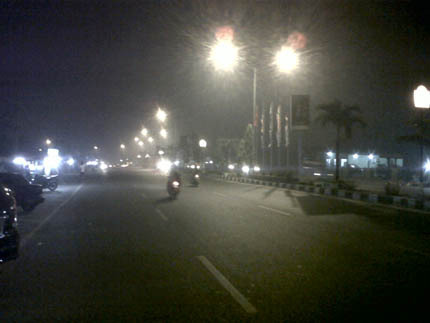 Dumai city, Riau province, when API hit record 500. 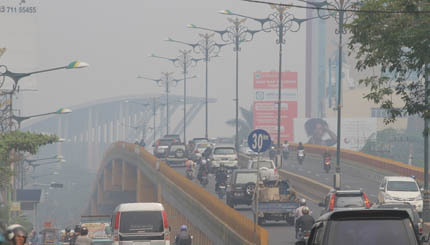 Pekanbaru, capital of Riau province, was shrouded by haze. Visibility was at about 150 metre in the city centre. A resident sprays water on a peatland fire in Pekanbaru district in Riau. 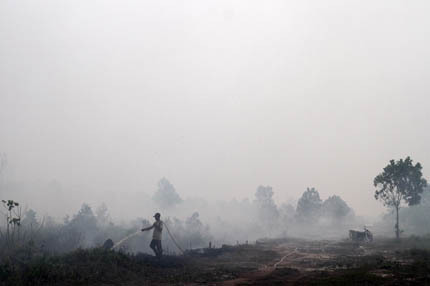 Smoke rises from a peatland fire in Pekanbaru district in Riau. 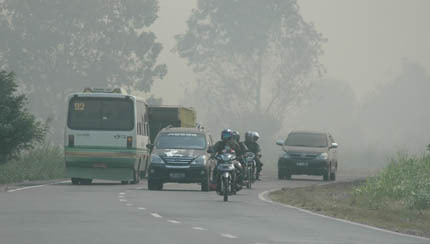 Motorists travelling along the hazy roads in Dumai, a city in Riau. 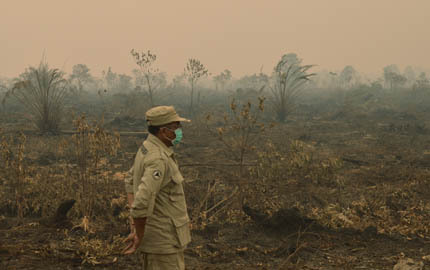 A man inspecting a peatland area in Tanjung Leban, Riau province. 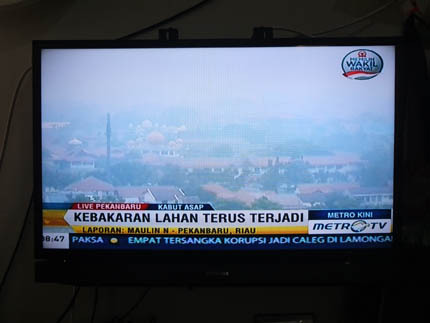 A screengrab of Metro TV's news report. 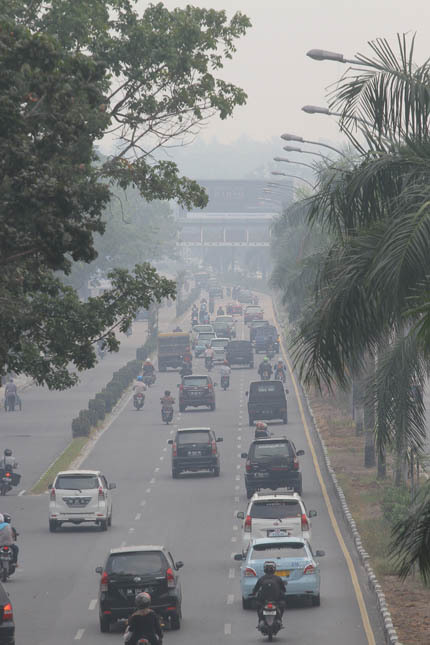 Pekanbaru, Riau province is shrouded by choking haze, delaying several flights at the Sultan Syarif Kasim II airport. Traffic on the roads on the outskirts of Dumai, a city in Riau.